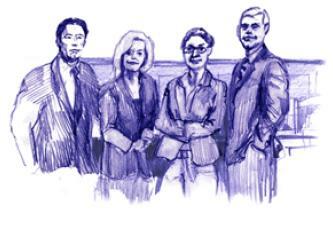 This page provides you with an overview of the legal professions in Denmark. The Danish Prosecution Service is the responsibility of the Minister of Justice, who supervises the public prosecutors. The service is composed of a Director of Public Prosecutions, Public Prosecutors and Chiefs of Police. The Director of Public Prosecutions (prosecutor general) conducts criminal cases before the Supreme Court and, in addition, takes part in hearings before the Criminal Cases Review Commission. The prosecutor general is senior to the other prosecutors and supervises their work. She or he also processes complaints about decisions made by public prosecutors in the first instance. The tasks and organisation of the Prosecution Service are described in Part 10 (sections 95-107) of the Danish Administration of Justice Act. It is the duty of the prosecution service, in cooperation with the police, to prosecute crimes in line with the Act. Section 96(2) requires that the prosecution service proceed with a case at the speed dictated by its nature. In this connection, the prosecution service must ensure that those liable to punishment are prosecuted and not the innocent (‘the principle of objectivity’). Six regional public prosecutors conduct criminal cases – appeal cases and jury cases – before the high courts and supervise the chiefs of police’s handling of criminal cases. Furthermore, regional public prosecutors process complaints against decisions made by chiefs of police regarding prosecution. Finally, public prosecutors deal with cases of compensation with regard to criminal prosecution and complaints against the police. The Public Prosecutor for Serious Economic Crime is responsible for prosecuting instances of major financial crime nationwide. The Chief Prosecutor for Serious International Crime has national responsibility for prosecuting international criminal crimes committed abroad. This includes cases concerning genocide, crimes against humanity and war crimes. The Chiefs of Police act as prosecutors before the city courts (first instance) and are thus – in addition to the management of the police – responsible for the inquiries and investigations conducted by the police district and the operation of the local prosecution service. The Danish Judicial Appointments Council submits recommendations to the Minister of Justice for all judicial appointments except the post of president of the Supreme Court. In practice, the Minister of Justice always follows the council’s recommendations. Disciplinary matters concerning judges or other legal staff employed by the courts are dealt with by the Special Court of Indictment and Revision. The Danish Court Administration has overall responsibility for the training and education of the courts’ legal staff. Professional judges in Denmark do not generally specialise in one or another legal field. They may hold a permanent or temporary (‘konstitueret’) position. Assistant and deputy judges usually handle less comprehensive cases (such as those brought by bailiffs). Lay judges participate, with some important exceptions, in all criminal cases heard by the first and second instance courts. In first and second instance civil cases, expert lay assessors can be invited to assist. Lay judges and expert lay assessors are appointed for a four-year period. The Danish Law and Bar Society was founded in 1919. All Danish lawyers (advokater) are mandatory members. FAAF is an association of employed lawyers and trainee lawyers, falling under the Danish association of lawyers and economists (DJØF). DJØF is Denmark’s largest trade union and interest organisation for students and employees in the fields of law, administration, state governance, research, education, communication, economics, political and social science. It has approximately 50 000 members working in these fields. Of FAAF’s approximately 1500 members, 900 are lawyers employed in private practice. In-house lawyers are not only part of the Danish Bar and Law Society, but can also choose to become members of the association of in-house legal advisors (Danske Virksomhedsjurister – DVJ). Today approximately two-thirds of the members of the DVJ association hold a lawyer’s practising certificate. The DVJ generally represents the professional interests of in-house legal advisors. It also works to promote the recognition and understanding of the position and rising importance of the in-house legal adviser to the trade community, authorities, NGOs and society at large. DVJ is a member of European Company Lawyers´ Association (ECLA). In Denmark, in-house counsel/legal advisors with a practising certificate fall under exactly the same regulations as lawyers in private practice. The Administration of Justice Act does not distinguish between the two categories of lawyers, and both are included in the Danish Bar and Law Society. This means that, broadly speaking, in-house lawyers have the same legal status as other lawyers in respect of code of conduct, professional secrecy, client-lawyer confidentiality, legal privilege and so on. However, the scope of the code of conduct has been increased to ensure that it applies to in-house lawyers, with modifications to cover the special conditions in which they work. Thus, legal privilege for in-house lawyers is governed by the same rules as those applicable to private practising lawyers. However, whether the threshold applied to in-house lawyers will be the same or lower than for other lawyers has yet to be tested in court. The only exception to the question of equal legal status concerns whom the in-house lawyer can represent under his/her practising certificate as a lawyer. The legal possibility of acting as an in-house lawyer is viewed as a tacit exception to article 124 of the Administration of Justice Act, which regulates for what type of company a lawyer may act. However, if the in-house lawyer does not have a law practice separate to his/her employment, and if he/she provides a customer or member with legal advice, and the customer or member is a consumer, and the advice is given for a commercial purpose, the law on legal advice will apply to the activity of the in-house lawyer with one exception: it will not apply to legal advice that provided by unions and non-governmental organisations. The reason for this exception is that such advice is not offered for a commercial purpose and is generally viewed as accessory to the ordinary member service, which relates to the purpose of the union. Legal advice given to an individual consumer by the employee of a union (who holds a lawyer’s practicing certificate) is therefore regulated only by the general rules of compensation in non-contractual relationships, and is only indirectly regulated by the Danish Code of conduct. This latter provides that, pursuant to section 126 (4) of the Administration of Justice Act, a lawyer must not (outside of his or her professional legal undertakings) display conduct unworthy of a lawyer in matters of a business or financial nature. Since July 2006, legal advice provided to consumers for commercial purposes has been subject to separate regulation – regardless of the educational background of the legal adviser. The law explicitly does not apply to legal advice provided by lawyers as part of their independent law practice. Nor does it apply to legal advice provided by unions or NGOs, as such advice is not deemed to be of a commercial nature (see above). Moreover, legal advice provided by financial operators falls outside the scope of the law insofar as the financial operator is subject to codes of conduct issued by the Minister of Economic and Business Affairs. However, as already mentioned, this is not the same as saying that legal advice provided by a person with a practicing certificate as a lawyer is not regulated by the law. If an in-house counsellor with a practicing certificate as lawyer provides legal advice to a consumer (and therefore someone other than his/her employer) and the in house counsellor does not have a law practice on the side, this service will fall under the scope of the law on legal advice if it is deemed to have been given for a commercial purpose. A legal adviser must conduct himself/herself in a manner consistent with the code of conduct. This includes performing his/her duties thoroughly, conscientiously and consistently with due regard for the client’s interests. Advice must be provided with the necessary promptness. Agreements on the provision of legal advice must be in writing. A legal adviser is not obliged to take out professional indemnity insurance, but information to this end must be included in the agreement on provision of legal advice. This information is available on the site of the Danish Bar & Law Society. The site provides English-language information on the Danish legal profession. It also contains a (Danish-language) directory of practising lawyers.